Halloween is a serious contender for my favorite holiday. I also love Christmas. I think they might be tied. I could care less about the rest of the holidays all year. I LOVE dressing up for Halloween. I always have. I have only missed a year or two my entire life. Probably in my earlier 20’s. But I always dress in a festive manner. I remember one year we didn’t have plans. Jason isn’t a big Halloween person. I still wore orange and black. Anyway, I have started to share my holiday passion with Jackson. 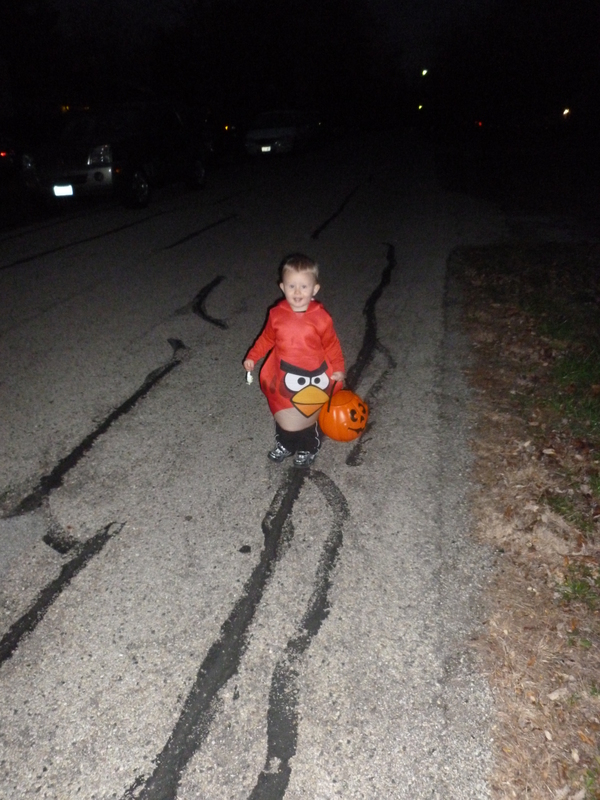 He went trick or treating last year. He was only about 9 months old. Just a couple days shy of 9 months. He was baby mickey. I even posted about it a year ago today! This year was amazing. All month we celebrated with our decorations, pumpkins, skulls, bats, cats, etc. He knows that these Halloween things say BOO. Ask him what a ghost says and he will say “BOO” He was SO into all of that this year. We had a slight snafu last week with him wanting to wear a costume. He was supposed to be a veterinarian but didn’t want to even try on the coat. I made it from scratch myself. A few things needed to be altered last week and he wouldn’t try it on for me to figure out where I needed to fix things. He threw a fit. So I decided to take him to a Halloween store and see if he wanted to pick out a different costume. 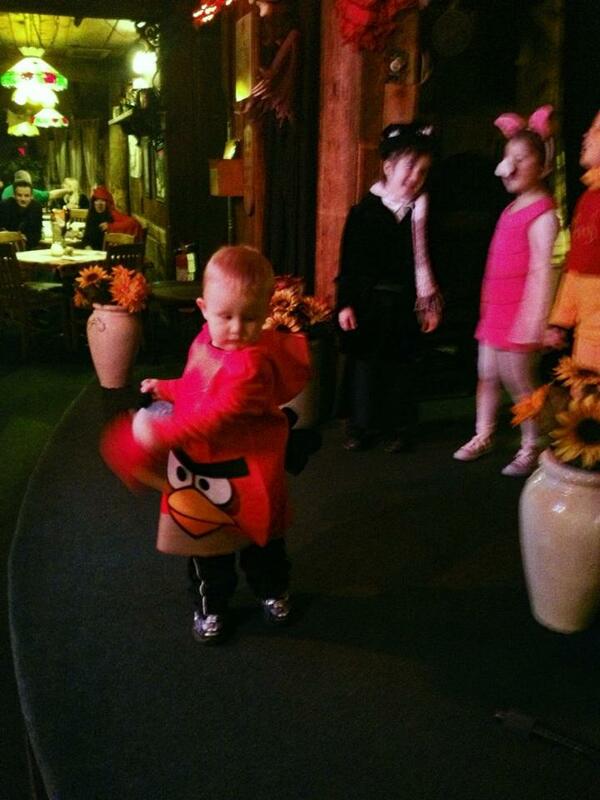 He chose an Angry Bird costume. He loves the Angry Birds games, even if he doesn’t quite know how to get high scores. His toddler apps he is a champ at but the Angry Birds, he just gets excited to see the birds fly and if he knocks down some piggies he is happy. Then we tried to get him to try it on at home. It didn’t go well Saturday night. I thought we wouldn’t be going trick or treating this year. 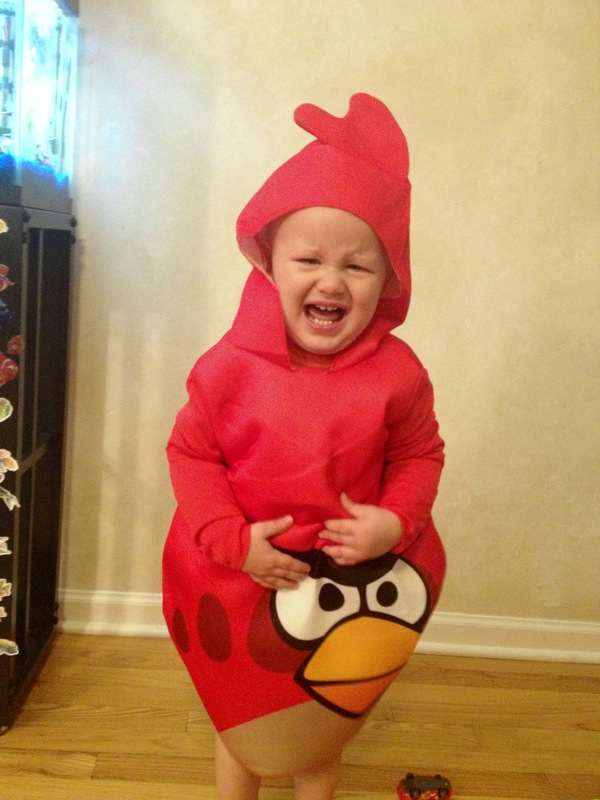 He really was an angry bird!!!! I was a little sad. I am his momma and I know him very well. 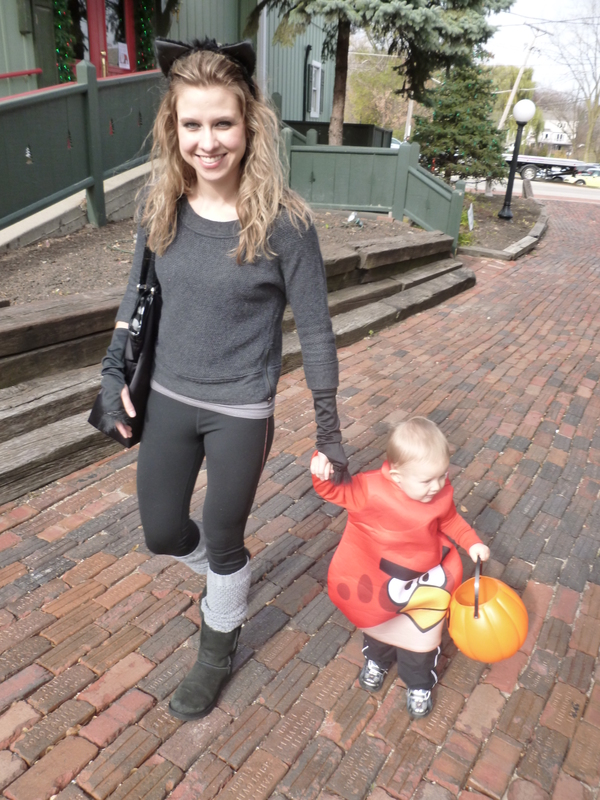 I knew he would love going trick or treating. He is somewhat of a ham. He loves attention, being praised, and showing off. Trick or treating is right up his hammy alley. My heart was sad thinking that he would miss out on this because he didn’t get the total concept. I decided to not try on the costume again but to really talk about Halloween the next few days. I talked up costumes constantly. I showed him when his favorite tv characters were wearing costumes. It worked!!! Well with the help of a sucker too. Yesterday around noon we were going to a trick or treating event. I got him dressed, didn’t mention the costume. I already had my kitty costume on. He got to watch TV while getting dressed, there was a Halloween cartoon on. Jake I think. Then I started to put on the bird costume. He started to fuss a little bit. I said “do you want a sucker?” Suddenly his tune changed. The rest of our day was amazing! 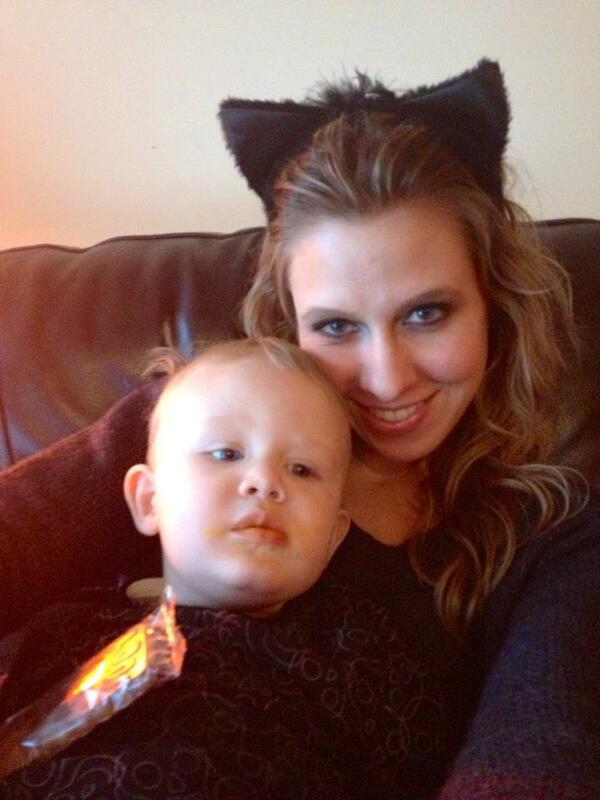 We had SUCH a fantastic Halloween. My hubby worked from home. 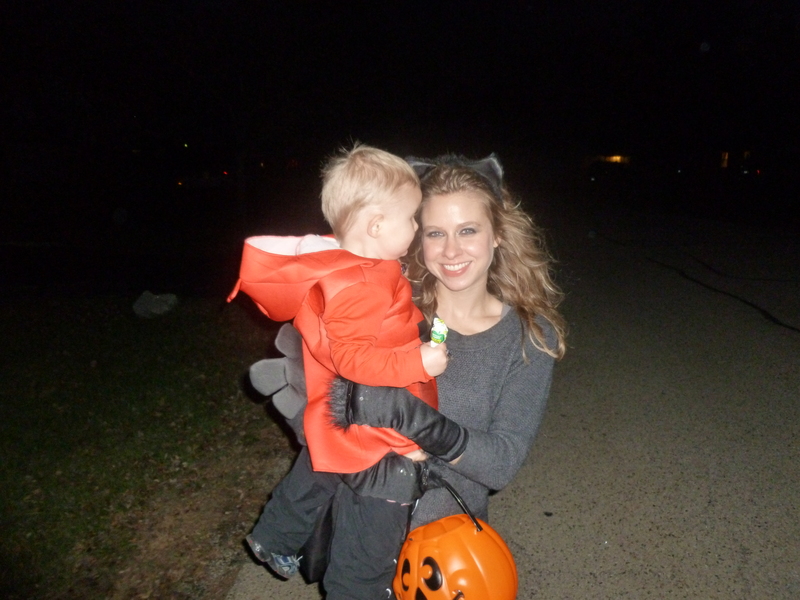 We went trick or treating twice. 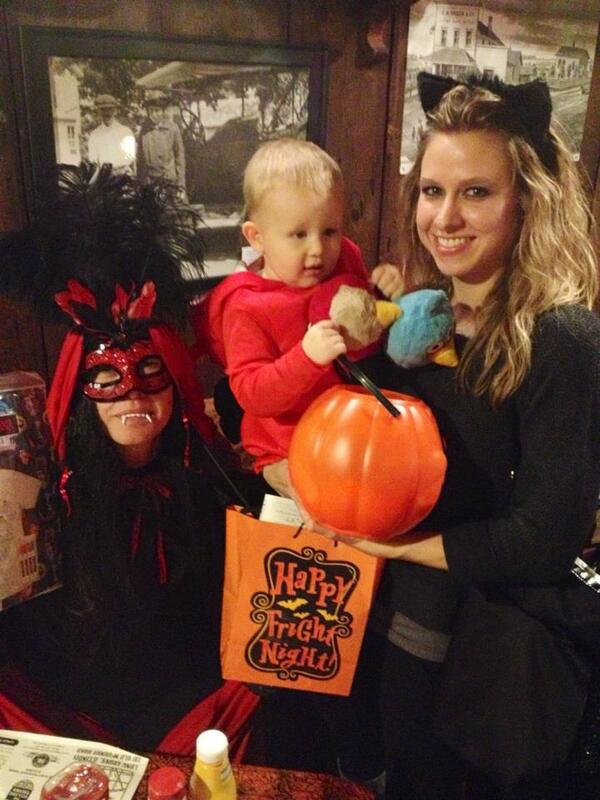 We went to a costume contest at a restaurant with my mom. 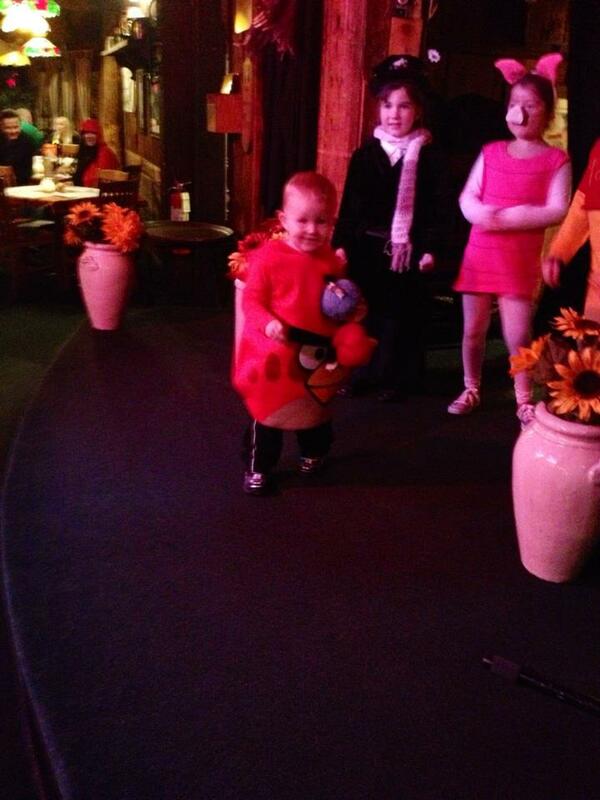 We enjoyed a nice dinner together, live music, and got to see our son lead the pack by hopping on stage and dancing. Soon 3 older girls followed him and danced together for quite a while. He had so much fun and knew he was wearing a bird shirt, as he called it. 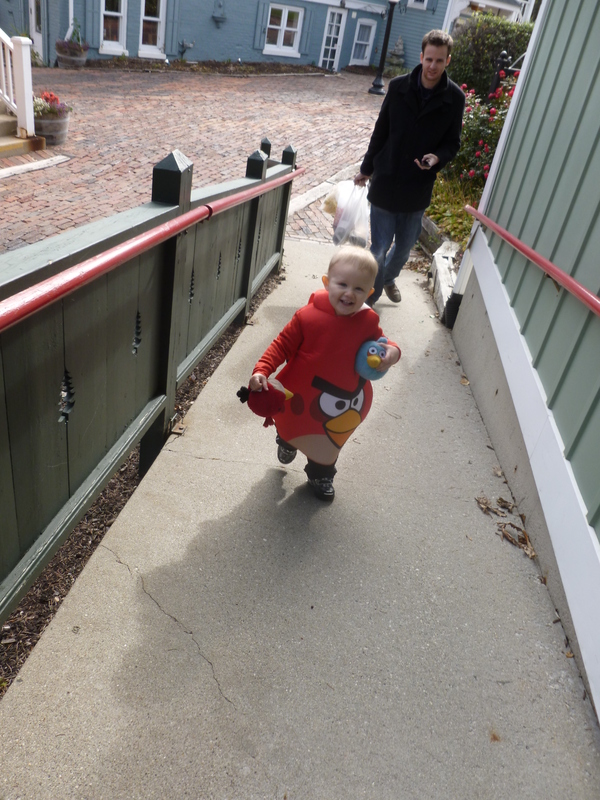 He even ran around saying “tweet tweet”. I knew knew knew he would have so much fun once we passed the costume hurdle. I am glad I didn’t quit. I am so happy I decided to find a way to approach this little bump in the road. To work with what I thought Jack would respond to best. It all worked out in the end. After this we went home to play for a while, he took a nap, I relaxed because I actually had a terrible headache that wouldn’t go away! Then we got ready for our nighttime fun. After naptime. He was still sleepy for a bit and wanted to snuggle watching the news with me. 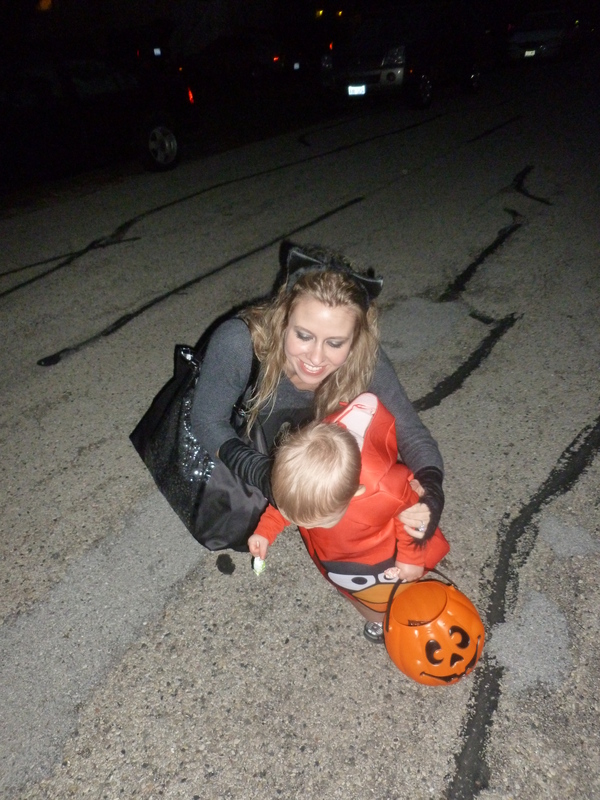 I was anxious to get out for round 2 of trick or treating! Trick or treating round 2! 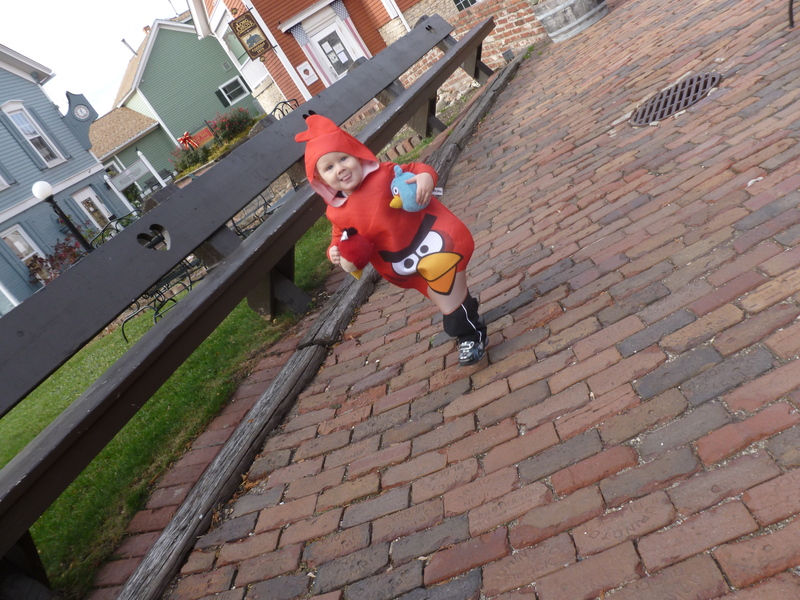 He was running up to all the houses. Loving every second. Then we headed back to Long Grove for a nighttime party! We live very close to Historic Long Grove, about 10 minutes away, 5 if you get all green lights and no traffic! I had a blast there. It is safe to say Jack loved being able to dance on stage and be the center of attention. Dancing on stage! He hopped up there and started to do his sweet dance moves. Us with Ga. She won the costume contest for the adult females!!! It is safe to say this was the most fun Halloween I have ever had. I am sure I will continue to say that each year, but I think that is ok. That means we are having fun together as a family. I love being able to share my joy of this holiday with Jack. I love even more that he soaks up that joy. All month he did, with the grand finale last night. I am a little sad Halloween is over. I am in no rush to take down my decorations. I probably won’t get around to it until this weekend. Today I just want to relax. All week we have been super busy, with his classes Mon/Tues. The open house on Tuesday. Yesterday was nonstop action. I think we need a relaxation day today! Lots of coloring, snuggles, car time, and movie time. I love this boy so so so much! I just can’t get enough of him. I am so happy we are in our 2nd round of holidays together. The firsts were fun but in all honesty I think the 2nd is way cooler. He understands things now, he finds joy in them. The 1st was more about us getting excited for his 1st fill in the blank. But now, as each year goes on, he will find special things in the holidays on his own. Like his obsession with pumpkins this year! He has an understanding of what is going on around him. One of the houses we stopped at didn’t answer right away. We kept trying to leave and he didn’t want to and kept knocking himself! He knew at this point, someone answers the door, they coo over him, and he gets treats! So smart. Last year he had no concept of that. I don’t think I will forget that moment. How he knocked so seriously. I hope everyone’s Halloween was as fun as ours! I hope you were able to find joy in your children’s excitement or maybe even the excitement of the kids who came to your door! Happy Halloween!!! !